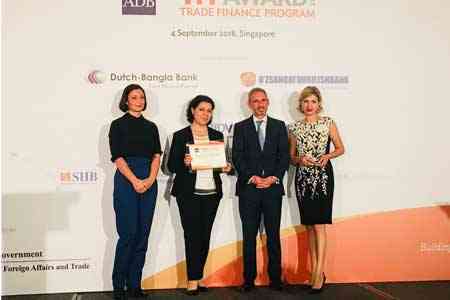 ArmInfo.The Asian Development Bank announced the winners of its annual TFP Awards at a Partners Dinner held in Singapore. This year ADB introduced a new award category, the TFP Momentum Award, to recognize the best performing issuing bank that registered the highest jump in transactions from the previous year. Ardshinbank is the first Momentum awardee as an issuing bank, which recorded the highest percentage increase in the value of transactions supported by TFP from 2017 to 2018 compared to the previous corresponding period.